If you are in a rush the best pedal fishing kayak is the Hobie Pro Angler 12. The Best Pedal Kayak for the Money is the Perception Pescador Pilot 12. Pedal powered kayaks are a relatively new topic in the kayaking industry and they certainly have made a splash, especially in the last 5 years. Probably one of the first things you look at when you are looking for a pedal kayak is the price tag. Why are kayaks with foot paddles almost $1000 more than their paddle wielding cousins? What are some of the advantages that you have when pedaling vs paddling? How does this relate to fishing kayaks? I’ll explain a bit below. What is better a pedal powered kayak or a paddle kayak? This comes down to personal preference but if you have been using a paddling type of kayak for a while then it may take a bit of time to get used to. After all you are using your hands and feet in completely different ways in that your feet will be doing a pedal ling motion and your hands will be used through trolling and steering the kayak the direction you want to go. If you are a traditional sea kayaker it may take a bit more time to get used to this as your feet and hands have completely switched positions in propulsion and steering. These are the most common differences between pedal and paddle kayaks so decide which qualities fit your fishing needs the best before having your heart set on one craft or the other. Now we realise that not everyone has just $2,000 laying around for a pedal driven kayak so we did a Best pedal kayak for the money section. Having said this the benchmarks of the industry are Hobie and Native in terms of getting a real good quality pedal drive fishing kayak. When looking for the best pedal kayak for your fishing needs there are some important factors you have to consider. 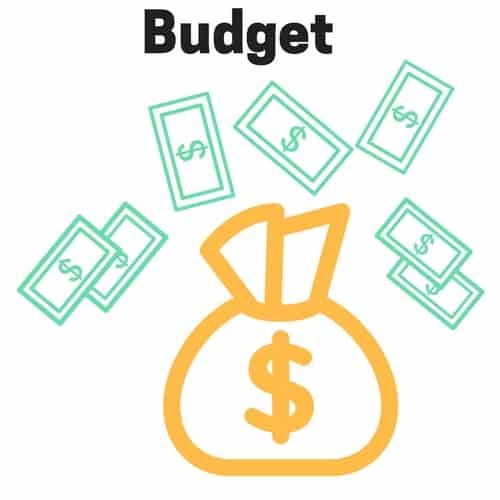 What is your budget when shopping for a fishing kayak with pedals? If money is not an issue then spending more money on a higher quality boat will give you more enjoyment and ease of use in the long run. If not this is not a huge issue as there are still some great vessels to be had. I get many questions from folks over why fishing kayaks with pedals cost more than paddle fishing kayaks. The main reason is that it costs significantly more for the fishing kayak companies to include a pedal drive to their kayaks. The increased cost goes towards high quality technology such as sealed bearings,alloys, research and development as well as hull reinforcement. A hull from say a Sun Dolphin Excursion kayak would not be able to take the increased strain on the plastic. As a result they need to be reinforced and bulked up. This is often overlooked but is probably one of the most important factors when choosing a sit on top pedal kayak. On average peddling kayaks are a lot heavier than their paddling counterparts because they have more reinforced plastic on top of the kayaks pedal drive. As a result you have to disassemble the drive out of the kayak whenever you are on the road. I will also say that it is a lot harder to transport a kayak with a pedal drive unless you are really strong and have a buddy with you or have a good system to get your kayak onto a car. Otherwise you may require a kayak trailer. When getting to and from the water a kayak cart is also recommended to get you from point A to B without straining your back on the way back from the water. This is especially useful if you are by the coast and you have to walk your kayak to and from the beach. Before choosing which pedal Yak I highly recommend that you look at the features of each craft and ask yourself “Am I going to be using this feature” This question alone will probably get you 50% of the way there when choosing a pedal fishing kayak. If you are a more serious fisherman I would say that more features will be better for you. If you are a fishing hobbyist or someone who comes down to the lake every so often to plump a bobber in the water then I would go on to say that no you won’t need a ton of features available to you. Many of these propeller driven kayaks prefer to go the route of being a bit bigger a bulky to accommodate those fisherman who want to stand up and fish off of them. This is all great for fresh water and calm bays but when things get really wavy or windy this extra bulk will be more a nuisance than anything else. If you want a foot pedal kayak that can fish in open water conditions then choose a hull that is narrower and less bulky. These are the best of the best in terms of best pedal kayaks for fishing. In my mind Hobie is still in charge of the game, not just because they invented it but the fact that every few years they update their Mirage Drive and strive to make it better. 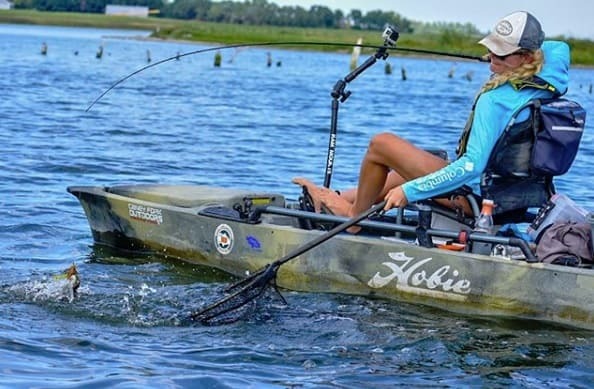 Now there are other fine fishing kayaks with foot pedals that are available but in our minds Hobie takes the cake because of their innovation and versatility. The Mirage Drive is genius because it is not just a propeller but more two fins that are designed like a penguins flippers. If you get into shallower water you simply do small pedal motions with your foot to avoid hitting the bottom. The price that you pay for these kayaks is well worth it if you are a fisherman who likes a lot of different options and operational uses. The main difference between these pedal fishing kayaks and the ones that are below $2,000 is that the ones above $2,000 go that extra bit further in terms of providing useful accessories and making your time on the water as enjoyable and stress free as possible. They also have phenomenal customer support that are very happy to answer any questions you may have. Why a pedal fishing kayak above $2,000? The Hobie Pro Angler is a kayak that is 12-foot long. This makes it compact enough to put into any truck or rack above your car with ease. This makes it very easy to take from your home to the beach or the river. Since it is made of polyethylene, it is very strong when you compare it with other kayaks. The polyethylene material also allows it to carry a significant amount of weight. It can carry up to 500 pounds weight. Since the Hobie Pro Angler has the capacity to hold six rods, it is great for fishing. It has four rod holders that are horizontal and two that are molded-in rod holders. The seat is elevated giving you a full range of motion with this sit-on-top kayak. It has also been hailed by many reviewers as the most comfortable fishing kayak available. This is because the Vantage CT seat has three different adjusting mechanisms to maximize comfort. You can customize the rigging as much as you want since it has H-Rail. You can easily add gear that you want to keep close to you including mesh pockets. The Kayak comes with mounting boards that are replaceable and with dual steering. The kayak has a seal hatch and an 8 inch twist to keep your valuables safe. Most of the reviews about the Hobie Pro Angler are excellent. The users love it and found it spacious, strong and easy to carry. Even tall customers found it very comfortable to use and fish in. The seat is highly adjustable and with a weight carrying capacity of 350 pounds is more than enough for big people. Many customers commented on how easy it was to store things on this kayak. A few reviewers have noted that it is one of the most stable fishing kayaks to stand on even when there are waves hitting the kayak. The Hobie Mirage Outback is a perfect kayak for fishing. It is very stable. It has tremendous speed and is very comfortable. You can manoeuvre the kayak easily thanks to the mirage pedal drive. There are newer advances including being able to back up using the pedals. The stability of the Pro Angler is also one of the best in the industry. Even if you try to overturn in when you are in the water, it is difficult to do so. It has height options so that you can adjust the seating as per your height. You can also recline using the Vantage CT seats. Along with the Hobie Outback you get a Mirage Drive 180. This helps in forward and reverse propulsion leaving your hands free. This is very helpful when you are fishing. You also get a paddle, rod holders and trays which are molded-in. There are spacious storage compartments. The Hobie Mirage Outback is Lowrance-Ready so it is easy to install fish finder systems. It also has a gear bucket that can easily fit in the hatch. You can easily fit all your fishing gear in the stowage that is above and below the deck of the Hobie Mirage Outback. Customers say that the kayak is excellent and that they can fish while cruising as they don’t have to paddle. It is stable and spacious. The rudder and ST fins are standard but are fine. A few customers had an issue with delay in delivery of the kayak. The Native Watercraft Slayer Propel 13 is an excellent fishing machine. It can stop immediately and has a great casting distance. It can go over 4 miles per hour normally and can go over 5 miles per hour when the wind is on your side. There is a dry hatch in the Slayer which is of 5 inches so you can store your things there. You get a padded carry handle and a 5 inch dry storage hatch with the Kayak. Since you can cast while standing on this kayak, you can cast for a longer distance as compared to when you are sitting. You get two rod holders which are flush mounted and you also have a forward facing, right-handed rod holder. You can also use it as a cup holder. One of the best features of the kayak is that it can easily carry weight of up to 400 pounds. It is 13-feet long so is very comfortable. It has a lot of space and is easily customizable as per your needs. Overall customers really liked the Native Slayer Propel 13. They said that it was durable and gives you a lot of exercise along with being perfect for fishing. One of the customers mentioned that they took it fishing for an entire night and didn’t have any issues. He even fished in the choppy waters of the upper Niagara River without any problem. A few of the customers complained about the rudder system which isn’t very well designed. Not everyone can just fork out the money to buy a higher end pedal kayak and that’s fine! If you know the benefits and limitations of owning a kayak with foot pedals and just want something with good propulsion any of these kayaks would be an excellent choice for you. The main differences to these and the more expensive foot powered kayaks is that they lack some of the accessories and potential add-ons that technical fisherman would find handy. Still these kayaks make great fishing kayaks that you pay significantly less for. Why a Pedal Fishing Kayak Below $2,000? Pods for bow storage, storage for bow tank-well and for stern tank-well. When it comes to value for money, the Perception Pescador Pilot is an excellent sit-on-top affordable kayak. It is filled with features that make it a great budget pedal kayak. It includes pedal drive system. The Pilot Drive is designed so that you can use the kayak the whole day long without needing to use your hands. This way you can focus on fishing. The Captain’s Chair has on-the-fly gear tracks that are adjustable and has tension knobs. This kayak has four rod holders that are molded-in, a transducer scupper, two YakAttack tracks, and two consoles for you to store mounting electronics. Most customers loved the kayak as it is a no-frills, inexpensive kayak which is great for fishing. It has a decent turning radius and good tracking. A few customers mentioned that it is difficult to use the kayak when you are offshore especially in rough weather. They also mentioned that the pedal drive system is a bit loud. When it comes to kayaks, the Mirage brand is very well known. The Mirage Compass which is the latest addition Hobie’s fleet of kayaks is a good budget option pedal kayak which works pretty well for kayak fishing. The kayak is simple and looks stylish. It uses the MirageDrive pedal system which has Glide Technology and is tested thoroughly and over the years. It glides through water giving you a very enjoyable experience. The seat of the Mirage Compass is very light and comfortable as it is a mesh seat which makes it breathable. The Mirage Compass is very stable and comfortable as it has a flat deck if you want to stand and fish and it has an over sized cockpit. The turning radius of the Mirage Compass is sharp so it is very easy to navigate and very nimble. You can easily turn it around even at tight corners with ease. Even though it is nimble, it can pick up excellent speed when it is in the water which makes it great when you want to pedal deeper in search of fish. You get many accessories like molded-in rod holders and H-Track accessory mounts. You can even install a a Lowrance® fishfinder very easily on the Mirage Compass as it has a transducer cavity. It has a seating capacity of one person but is very comfortable. It is slightly heavier than the above kayak at 68 pounds and has a weight capacity of 400 pounds which makes it excellent if you want to travel long distances. The customers mentioned that it is very comfortable to be in this kayak. If you are a large or tall person, stability may be an issue but you can use an out-rigger system. The seat is comfortable and you can fish for a very long time without feeling uneasy. The Brooklyn Kayak BKC Pedal Drive Solo Rover Kayak is has a design which works well for kayak fishing. It is great for distance travelling too. The BKC peddle kayak has made sure that there are no extra and unnecessary accessories in the kayak which will increase its weight. The kayak is very stable in water. It has a hull that is 10 feet and 8 inches long and is 34 inches in width. This makes it very stable. You can easily slide through choppy water, ride over currents and glide over water that is still with ease and grace. Since the kayak is only 60 pounds, it is easier to carry it back to your vehicle on a roof rack or kayak trailer. You can carry it easily back to the vehicle because it has handles that are built-in at the stern and the bow and on both the sides of the hull. The best feature of the kayak is its pedal system. It has bicycle-style pedals. These pedals turn a high-efficiency propeller. You can keep the paddle aside. This is a perfect way that you will be hands-free and can focus on your fishing. The pedals have straps which are adjustable. This helps you to secure your feet properly. You can remove the entire system if you wish when you want to use paddles or if you want better speed and power and want to to upgrade to a trolling motor. The customers were happy with this kayak. They found it easy to use, fast and within the budget. It is great value for money. It is very easy to fish when you are in this kayak and you can take it out in the roughest of weather and water conditions. A couple mentioned that an anchor would be great as that would help since you won’t have to constantly pedal. The achilles heel to all pedal fishing kayaks is that they are very limited in terms of shallow water usage. If you are a fisherman who likes to cast from the shallows and brush it will difficult to do so with a kayak pedal drive. Thankfully many pedaling kayaks actually have the option of being able to take out the pedal drive from the kayak so that you can accomplish this. If you are a fisherman who fishes in the brush but also likes to go in deeper waters consider this when looking for a pedal kayak. Pedal kayaks are better suited to larger lakes as you can really use your pedal power to get to a favored fishing spot quickly. Their stable fishing kayak platforms also means that you can stand up and ‘sight fish” if the water is clear enough or simply fly fish. A lot of these pedal kayaks are built to be able to stand and fish off of so large lakes are the ideal environments for these yaks. For this reason lots of tournament anglers are switching from paddle power to pedal power. This is a bit more of a tricky matter. Pedal kayaks are great for oceans if the conditions are right and preferably you are closer to shore. I say this because pedal kayaks are not necessarily made to be fishing miles off of shore because of their bulky frame and it can become dangerous . The bulky frame inhibits the kayaks ability to absorb waves like a sea kayak can because of it’s slender frame. If you live south there is also the very real danger of getting attacked by great whites, tiger, bull sharks and other creatures and there is the added dangers of getting trapped in a storm, currents and hypothermia to name a few. So the short answer is try ocean fishing miles off shore if you are well versed in safety procedures and equipment. Otherwise stick closer to land and fish on calmer days. How Fast is a Pedal Kayak? Unless you are super handy you will most likely have to get a pedal drive kayak that has a removal option (ie paddle configuration). If you want something super basic you can always give this guys idea a go! I can try to explain it but it is just better of you watch the below video. Is the fishing that you will be doing suit pedal kayaks better or is it better to look for a traditional fishing kayak? If you have decided on a Pedal kayak what is your Budget? How are you going to haul it? This is a weight dependant criteria. Where are you planning on fishing? Salt Water? Fresh Water? Lake? On the Coast? In a Bay? On the River? Decide which pedal kayaks suit each environment. Decide on what accessories you want your pedal kayak to come with. Many Pedal kayak manufacturers have a whole wide array of different accessories you can add. Most of all have fun paddling and catching all those fish! If you want to tell us about what you have caught let us know!